There is salted, sweetened popcorn, as well as popcorn in a beautifully decorated bag. So now to the latter. Step 1. Cut a rather big bag and fix its edges. Plaster the bag with red crepe paper and fold its edges inside the bag. Step 2. On the opposite side of the bag pinch small holes and thread a ribbon through them, fixing inside with a knot. Step 3. Cut multicoloured hearts from magazine illustrations and glue to the edges of the bag. Step 4. Make popcorn in the microwave and put in the bag. Those who want something more original can colour the popcorn pink with grenadine syrup. The bag can also be filled with other kinds of sweets and dried fruit. 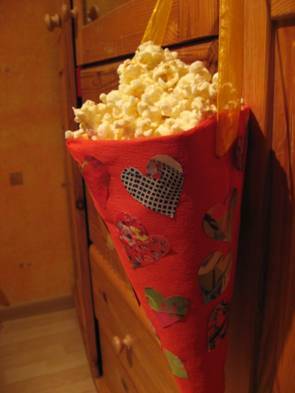 Hang the bag somewhere near your cosy sofa and the romantic movies night can start!